Why am I receiving the new Cost and Charges report in my valuation? Due to new rules that have been recently introduced by the MiFID II regulations, all investment companies must now explicitly detail the costs and charges incurred in the management of portfolios. Waverton now has to produce an annual report with a breakdown of these costs. These costs have always been applied to your investments but have not been disclosed as comprehensively as in the new report. Why do my Cost and Charges reported differ from the management Fees that have been previously invoiced and paid? Management Fees shown in your valuations statement summary or invoice represent Waverton’s annual charge for the investment product or service provided by the company. These are usually debited from your investment directly or via remittance. Your quarterly valuation also details information about any dealing charges and stamp duty or taxes incurred during transactions that have taken place over the reported period. The new Cost and Charge report provided in your current valuation includes these direct charges and any underlying costs involved in holding certain types of investments. Many third party funds for example, have ongoing and transaction costs that are not directly deducted from your investment but affect the performance of the fund and all investors are affected by them. How do I understand the cost and charges of my investments? Collective and Waverton fund costs – On-going and transaction charges incurred by the fund(s) that you are invested in. Execution charges – External brokerage, Stamp, tax or market charges that are applied as part of any transactions undertaken. This section is subsequently broken down further on page 2 of your Cost and Charges report and provides a summary of all the service, product and execution charge types. 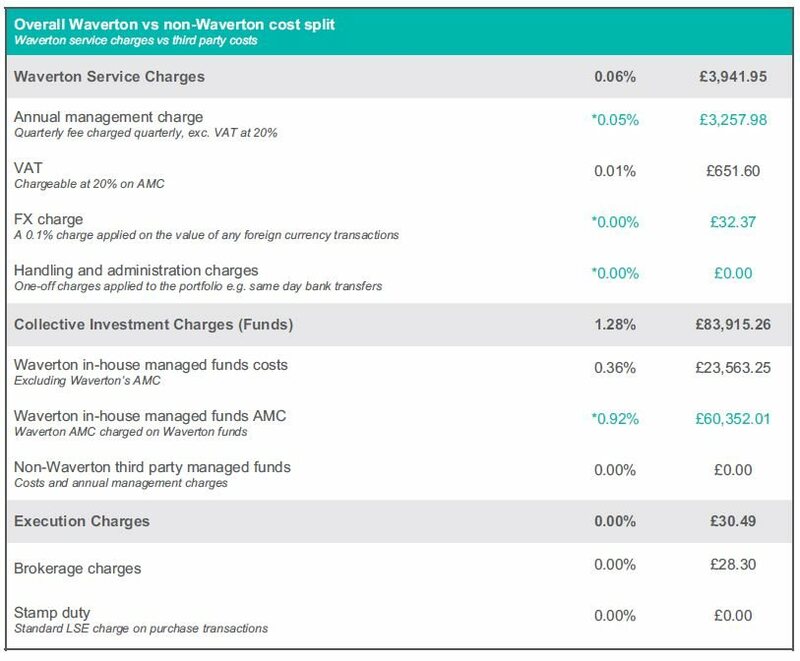 This displays the difference between the charges applied by Waverton in the operation and servicing of your investment and those incurred by third parties, these include VAT, execution and third-party managed fund charges. What period does the Cost and Charges report against? The cost and charges report included in your valuation covers the entire year of 2018.